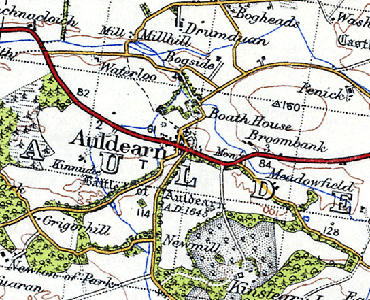 Auldearn is a village and area steeped in history. The Neolithic stone circle at the eastern edge of the village shows that people were living here more than 4000 years ago. The ring cairn at Moyness continues that line of evidence into the Bronze Age. The Castle of ‘Auld Eren’ was built in Auldearn sometime in the mid 12th century, attributed to William 1st ( William the Lion), it stood on the site of the present Doocot. In the 1180s Gillecolm of Maddertie , the constable, betrayed the royal castle to the forces of Donald MacWilliam, who then most probably destroyed the fortifications. In 1308 the castle was the scene of the surrender of the rebels known as the ‘Men of Moray’, and their leader, the Earl of Ross, to Robert the Bruce . The present name of the village is thought by some to have come from the name of the castle, ‘Auld Eren’ but the Gaelic name for the village was ‘Allt fearn’ , which is ‘ The burn of alder’ . It is possible that the castle just adopted the name that already existed. To further complicate the situation, Shaw, in his ‘History of Moray’ explained that the name came from the Gaelic, translated as ‘ the iron coloured burn’. I don’t suppose we’ll ever really know….